Just thought I'd post this review of SWA in today's Guardian newspaper. Not very good, but any Neil news is good news, eh? After spending most of the eighties as the least hip man in pop, Neil Young has become an unassailable icon, his every utterance greeted with unanimous approval. that he supported Reagan and then Ross Perot seems forgotten in the drive to canonise him as the weathered old sage of rock. Niether his clothes- peg-on-nose whine or his raspy guitar-playing ever comes in for any criticism - they're considered proof of his rugged individualism. 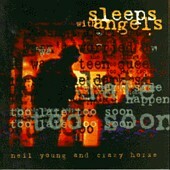 Sleeps With Angels is, believe it or not, his 28th solo album since 1969. The last studio album, 1992's Harvest Moon, was Young-as-usual, but in a softer than normal mode that recollects his early albums. Sleeps With Angels, though, has only a superficial resemblance to anything he has done before. For once the automatic praise is well deserved. The title track eulogises Kurt Cobain who, it seems, Young tried to contact before his suicide. One of the noisiest songs on an essentially low-key album, it's full of distortion and big guitar, through which Young's voice fumbles faintly. Driveby deals with the same basic subject - the death by shooting of a young person - in a different way, with sombre piano and slow, deep-voiced choruses Backing group Crazy Horse, who have returned to Young after an absence, extract maximum emotion from their harmonies. Most the album isn't as depressing as that. Young's main preoccupations are love and family and the state of the world - in that order. Western Hero, Trans Am, Safeway Cart and Piece of Crap are Neil the old Woodstockian having a go at the establishment. The satirical heavy rock of Piece of Crap is cunningly situated just after the elegant, emotive Trans Am. Before that, Young's moody guitar playing compensates for Safeway Cart's pretty awful simile about life being like a supermarket trolley. The best songs are the first two, whose brooding, musing feel depict a Young facing middle age and beyond. Prime of Life is a lilting LA cowboy rock rendered melancholic by Frank Sampedro's keening flute; My Heart opens with perky "tack piano" and turns into a subdued, almost ethereal ballad containing some of the band's most moving harmonising. Whatever Young comes up with next, he'll have a hard time bettering the heartaching prettiness of Sleeps With Angels. Ducking to avoid the flames from all those fervent real ale drinkers out there... Don't worry, guys, back on the Sam Smith's tonight..!